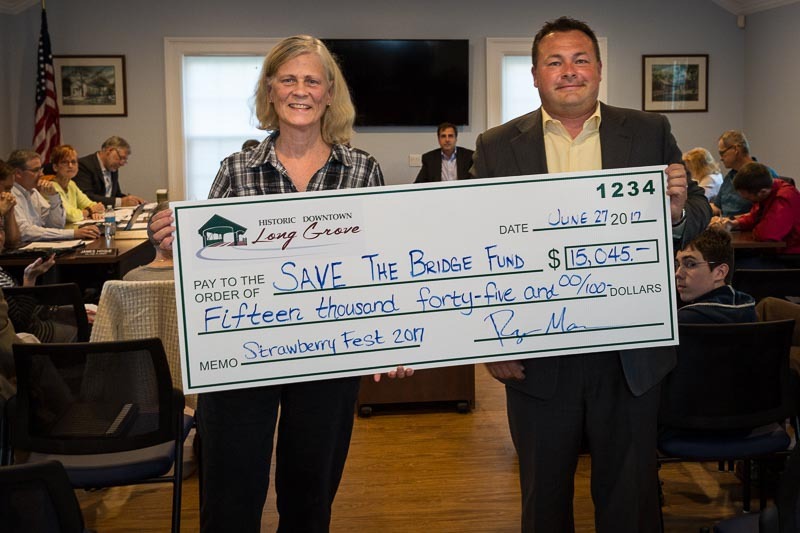 The fundraising campaign to save the covered bridge now exceeds $50,000 in donations and pledges. The Village of Long Grove was featured recently in two Chicago Tribune stories (see links below) and both articles spoke of the current efforts by the community to get our covered bridge on the National Register of Historic Places. In addition, several fundraising efforts are underway to generate private donations to help offset the public funds that must be allocated to pay for preservation of our iconic bridge. More and more concerned community members are becoming involved with efforts to keep our one-lane bridge by signing the online petition, purchasing raffle tickets, making donations to the covered bridge fund, and speaking up in support of preservation at community events and gatherings. 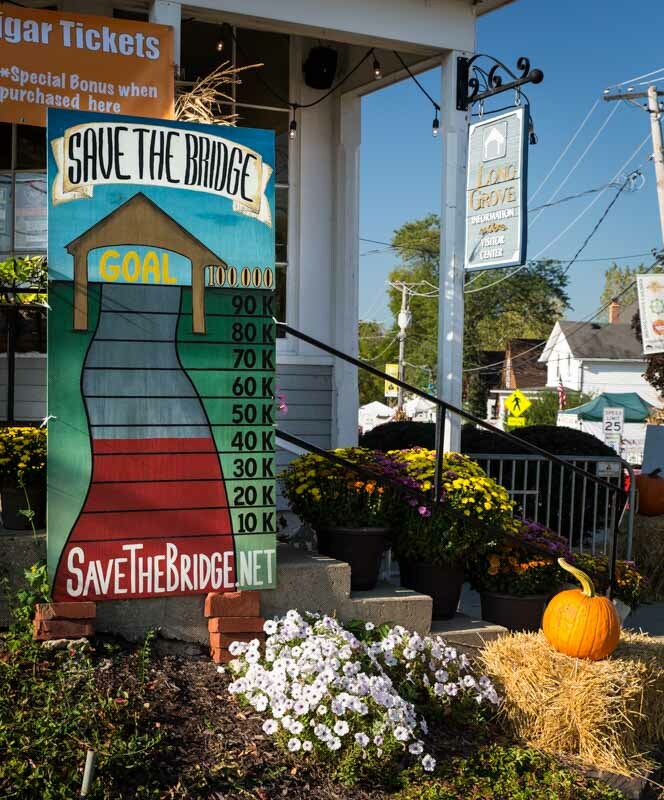 The gauge at the downtown crossroads will be updated soon to show that private efforts have now surpassed the halfway mark of the goal of raising $100K in donations and pledges to save our historic bridge. More information on ways to help can be found by visiting SaveTheBridge.net. After the bridge was ultimately recommended by the historians on the State of Illinois review committee, the Historical Society was expecting to hear earlier this month from the National Park Service regarding the application to be placed on the National Register. A request came for more documentation pertaining to the scarcity of this type of bridge in our area of Illinois and it’s local significance. The listing process is iterative, with each draft of the application being reviewed by a new historian who brings individual interests and experiences into what is significant and worthy of elaboration. The federal application itself plays a role in documenting our national history, so all involved in the process want to take their time and get it right. With this being the last level of review, the end is now in sight even if it takes a bit longer than desired to get there. More information on this topic can be found at LongGroveHistory.org. This past weekend my husband and I took a drive up to Michigan to enjoy the fall colors, and we purposefully visited the town of Allegan, Michigan to see their one-lane iron truss bridge over the Kalamazoo River. Built in 1886, this bridge was almost lost in 1979 when rehabilitation was deemed more costly than replacement with a two-lane federally funded structure. The local community rallied and got the Second Street Bridge listed on the National Register of Historic Places in 1980. Because the bridge was not a critical transportation corridor, Allegan city officials were able to persuade the federal government in 1981 to fund rehabilitation, even though the project would not meet the federal standards. The bridge is beautiful, with a pedestrian walkway decorated with iron latticework and end post finials. It is a centerpiece and source of pride for the small town and is featured in the logo for the city of Allegan. 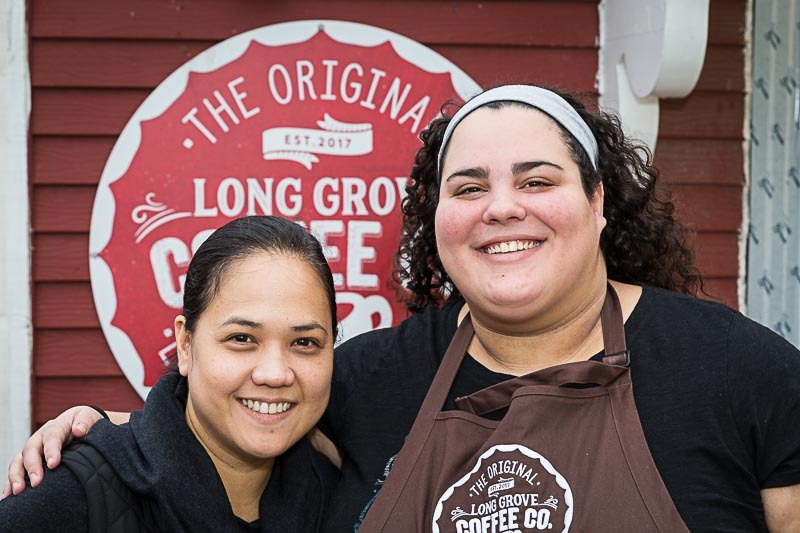 This story and it’s positive outcome and correlations to Long Grove make me hopeful. But we all know that for every historic bridge that has been saved, many, many more have perished. I truly hope that the story history writes years from now about our Long Grove covered bridge will be a happy one. 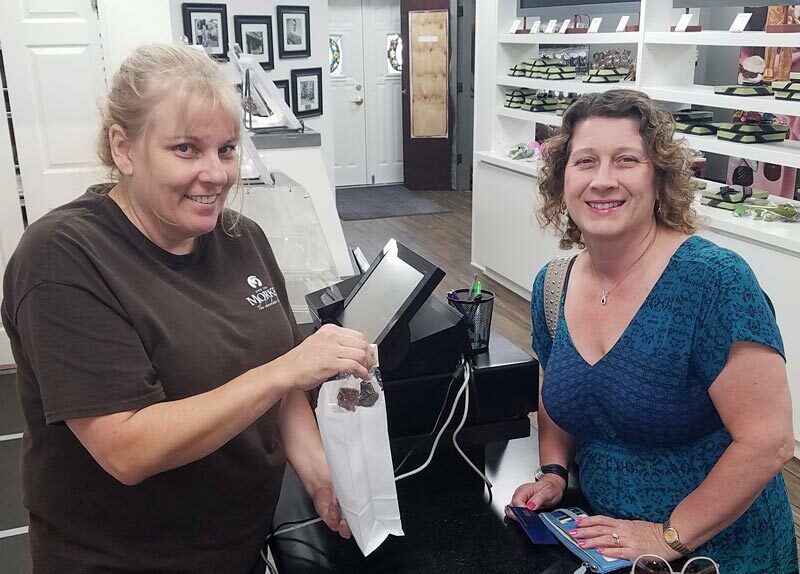 Cathie Olson is shown helping me satisfy another chocolate craving at the new Morkes Chocolates shop in Long Grove. My relationship with chocolate is simple–resistance is futile. As a child, I always tried to give it up for Lent and almost never made it the 40 days. As an adult, I try to cut back from time to time when I need to lose a few pounds. But in my opinion, it’s not really a perfect day if it doesn’t include a little chocolate somewhere. Imagine my delight to discover that we have one more shop in town to satisfy my sweet tooth, Morkes Chocolates! This week Long Grove welcomed our newest candy store with a celebratory ribbon cutting. Open since August 1st, Morkes is located in the red schoolhouse building on Fountain Square that formerly housed the Long Grove Confectionery. The Morkes family originated in France and started in the candy-making business back in 1920. Further generations continued the family tradition and opened the original Morkes Chocolates in Palatine, Illinois in 1967. Today, the Palatine location also serves as headquarters and production for the company, with additional stores in Huntley and now Long Grove. 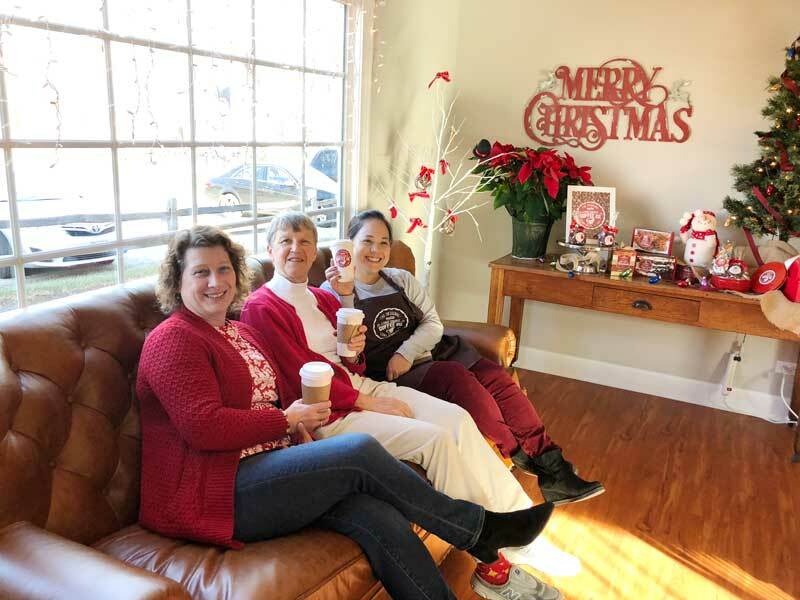 Current owner Rhonda Dehn is the 3rd generation of the Morkes family to craft delicious chocolate treats here in the northwest suburbs. I have personally sampled many of the mouth-watering choices available (I know, it was a tough job, but doing this blog requires painstaking research!) and my favorites so far are the lemon creams and signature white chocolate pecan “puppets”. Later this fall Morkes plans to offer classes and private parties in the upper floor of their building. I am intrigued by the prospect of learning how to temper chocolate, dip & decorate, and I really need to know what ingredients are involved with “extreme” fondue! Morkes joins our two other village candy shops, Ma & Pa’s Candy and the Long Grove Confectionery. The Confectionery has moved to another location in our historic downtown and after a summer of renovations is slated to reopen in October. Is this potentially too much of a good thing? I view having additional chocolate stores the same way as being blessed with another child– more to love! Putting on our “Boogie Shoes” for a ballroom dancing lesson at the new Fred Astaire Dance Studio in Long Grove. I have to admit that I’ve been having a lot of fun this summer. One of the main reasons that I stepped away from the demands of being Village President was that I wanted to have more time to spend with my loved ones, doing things that I enjoyed and that were important to me. The last few months have been filled with travel, hiking, camping, downtime in the pool, and some very satisfying community service. 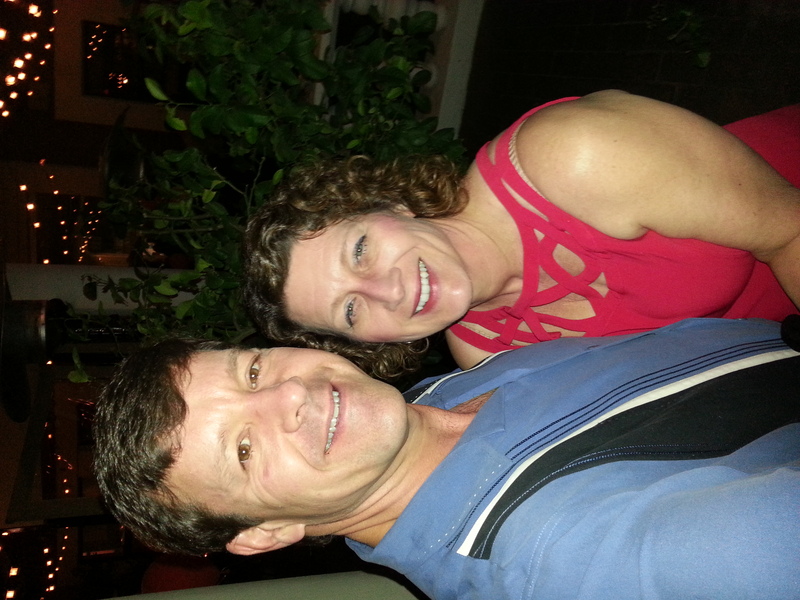 I have also recently discovered something new that allows me to spend time together with my husband, have some fun, and contributes to our goal of staying healthy–ballroom dancing! Yes, we have started taking lessons at the new Fred Astaire Dance Studio in downtown Long Grove. 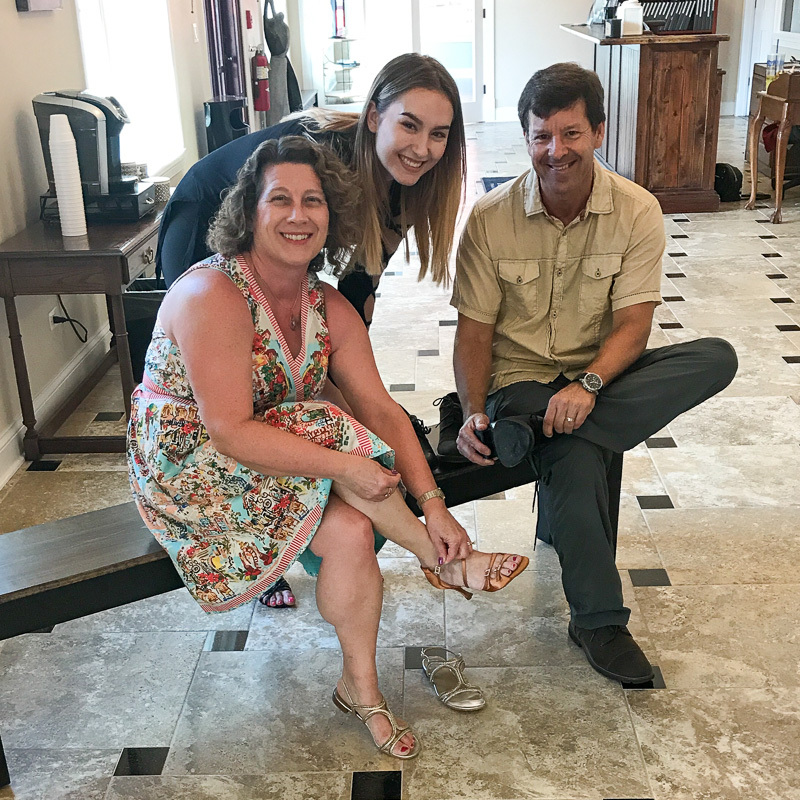 Located at the former Red Oaks property, owner (and former “Dancing with the Stars” pro) Jesse DeSoto has transformed a barn into a grand ballroom. Both Aaron and I have gotten to know Jesse over the past year as he has been renovating and getting the new property up to speed. So when we recently received invitations to our niece’s Quinceanera and a neighbor’s wedding, I knew just who to call to get us ready for the dance floor. I usually have to drag Aaron out when the music starts at special events, but he agreed to give our new dance studio a whirl. We have found both the staff and our fellow students to be extremely friendly and very welcoming. 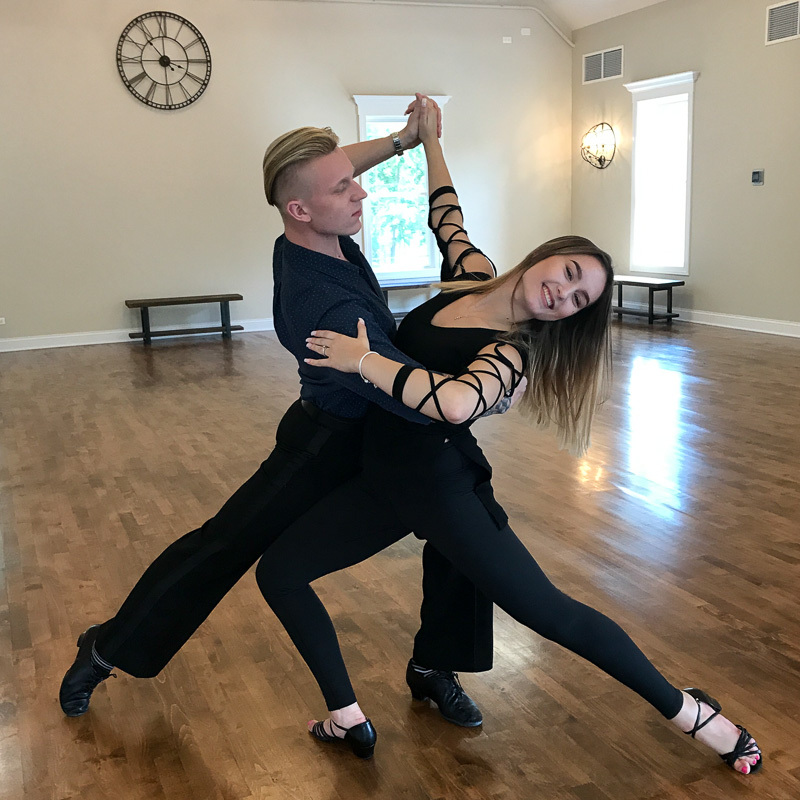 Our instructor, Brianna, is patient and encouraging and we have learned the basics of the rumba, fox trot, waltz, and push-pull. So far, we are having a blast! Not sure that we will ever strike as lovely a pose as our dance instructors Vlad and Brianna Nalyvaychuk, but we are having fun trying! Last summer a new festival debuted in Long Grove, known as Vintage Days. The entire event was a huge success, pairing old-fashioned fun with community group volunteerism to produce a hometown festival put on by locals, for locals. Right now, organizations such as the Long Grove Community Church, Long Grove Performing Arts Academy, Long Grove Historical Society, Long Grove Arts & Music Council, and the Historic Downtown Long Grove Business Association have partnered together to plan a weekend full of family friendly entertainment and shopping, August 19th and 20th. Over 40 antique, vintage, upcycled, and/or reclaimed dealers will have unique items for sale on the Robert Parker Coffin Road street market in front of the covered bridge. The bridge crossing will be open to pedestrians, bikes, and vintage tractor traffic only, so it will be the perfect opportunity to come linger under our iconic bridge, which is poised to be listed on the National Register. Admission and parking are free, as well as the live music, historic tractor rides, ice cream social on Saturday at the church, and penny carnival on Sunday at the farmhouse. A couple of new activities this year include the Pop-Up Car Show and two entertaining dramatic presentations at our farmhouse “back porch” stage. The car show will feature registered VIP parking for classic cars in the Stemple parking lot. On Saturday at 4:00, our farmhouse stage will host “A Salute to Old Glory,” as narrator Mike Dvorak takes audience volunteers back to 1814 to tell the story of the Star-Spangled Banner, followed by “Old Glory in Barnwood,” a presentation by artist Marie Roth featuring stories and selections from her celebrated collection of historic flag recreations. On Sunday, trade in your pennies (if you don’t have any, we will give you some!) for a chance at old-timey games and nifty prizes at the Penny Carnival from noon till 2:00, then stay for a wacky 1-act melodrama, “Polly Pureheart Prevails,” presented by the summer session theater students of the Long Grove Performing Arts Academy. Showtime for the half-hour performance is 2:00. Cap off the day by attending the 4:00 Arts & Music Council concert on Towner Green featuring the Maxwell Street Klezmer Band. And don’t forget–all of this is free of charge! Visit longgrove.org for a full listing of all the weekend activities. Plan to bring the kids and grandkids to downtown Long Grove Saturday and Sunday, August 19th and 20th, for one last blast of summertime memories before school kicks into gear once more. Vintage Days will be rocking and rolling fun for the entire family–be there or be square! 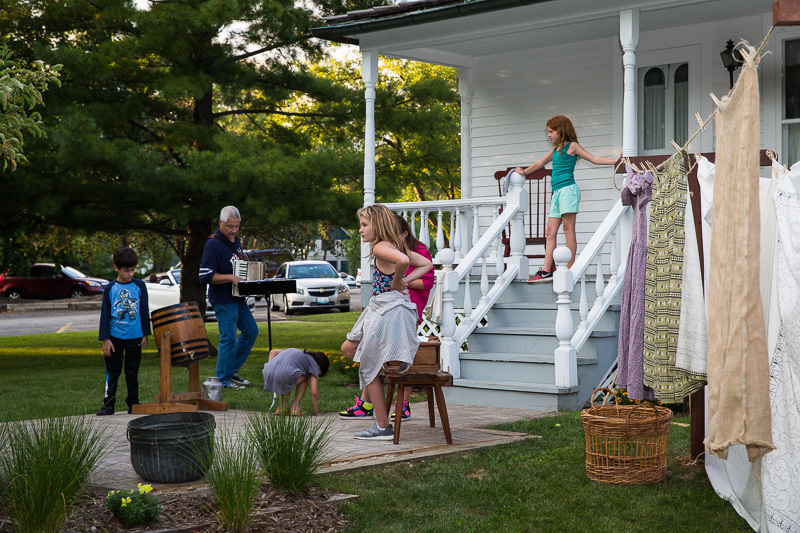 Members of the Long Grove Historical Society celebrating at the Grand Opening on July 15, 2017. It was so great to see the Stempel parking lot filled today, and not because of a festival but because so many locals showed up to welcome a new business in town. 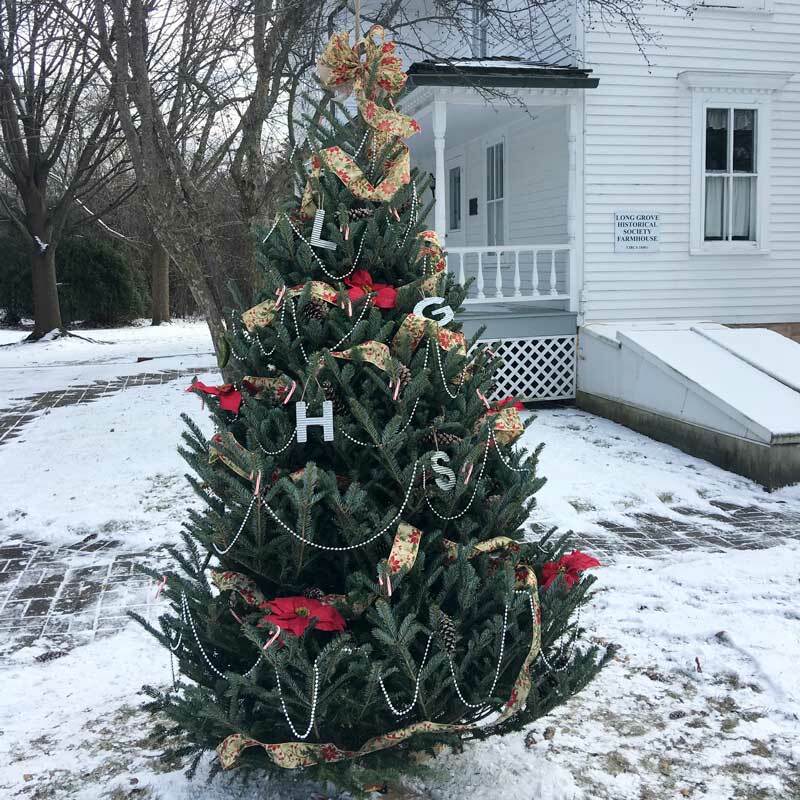 It has been nearly ten years since the former Studio of Long Grove closed their doors, and this property next to the Historical Society farmhouse has sat vacant much of that time. 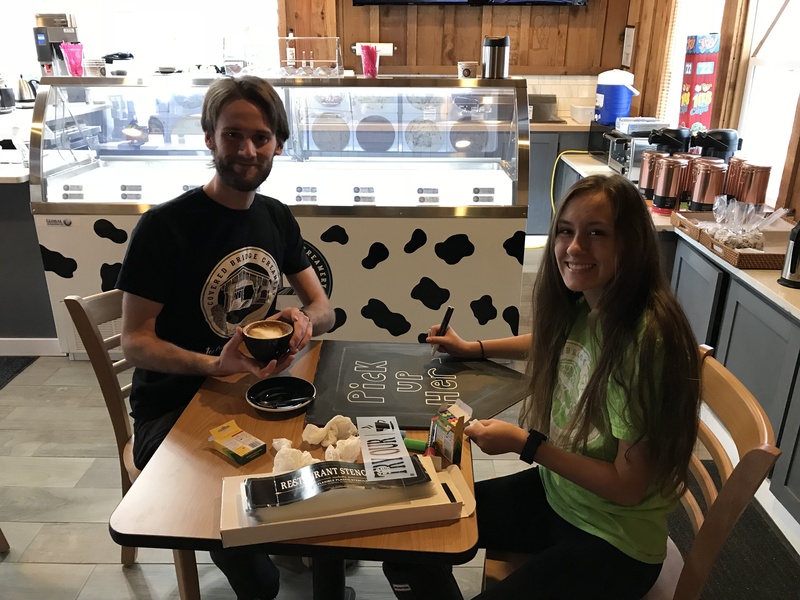 We are all thrilled to see Buffalo Creek Brewing up and running, and the crowds checking out this new local hot spot were in a celebratory mood at the Grand Opening today. 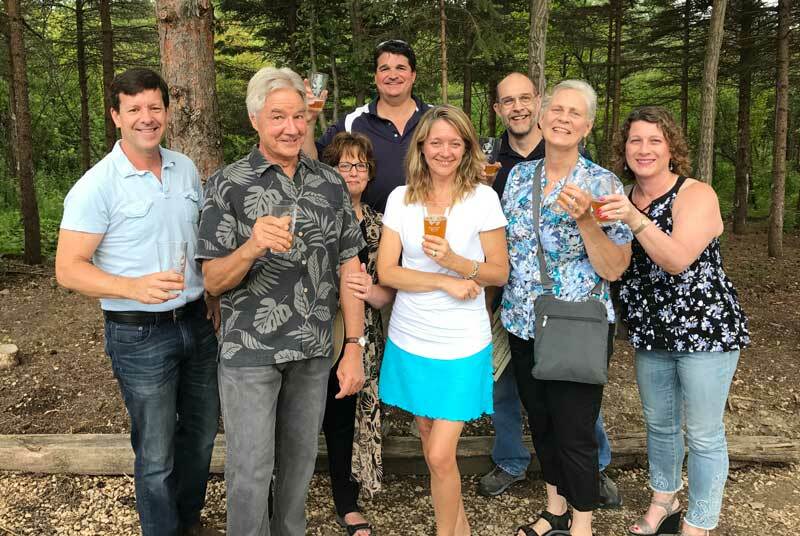 The event featured a ribbon cutting, samples of featured craft beers brewed on site, and bands on the outdoor lawn throughout the afternoon and evening. The weather could not have been more perfect for the festivities and it was wonderful to run into so many friends and neighbors toasting to the success of this welcome addition to our historic downtown. 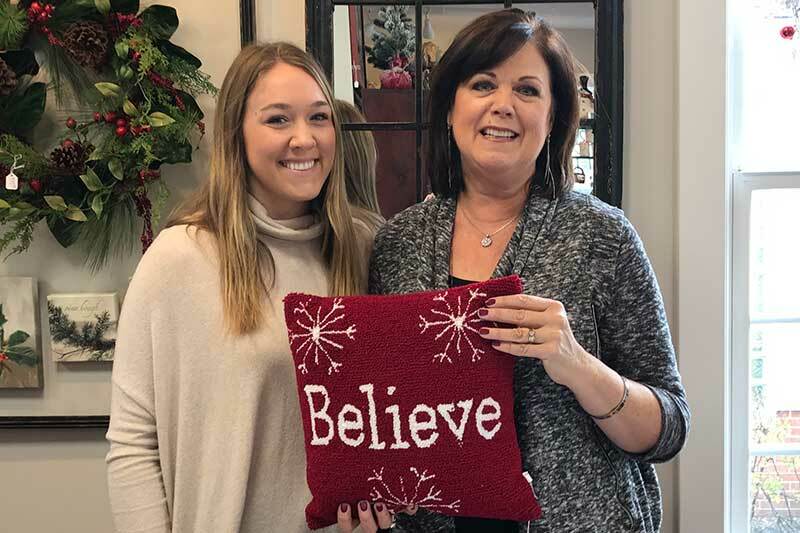 Here’s to owner Mike Marr and his family and staff as they continue to work hard to build a new business in Long Grove and help with the revitalization of our Village–Cheers and Best Wishes!! 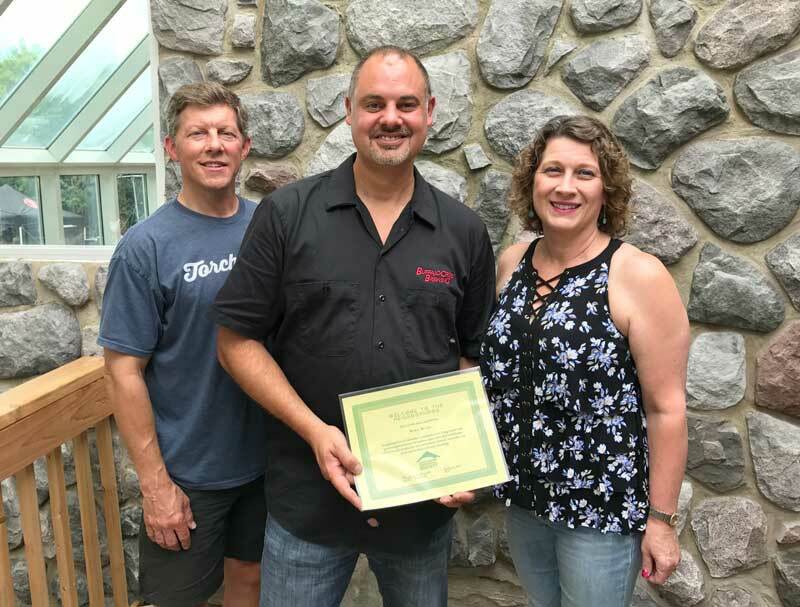 L to R: Dale Perrin, Director of the Lake Zurich Area Chamber of Commerce, Mike Marr, owner of Buffalo Creek Brewing, and Angie Underwood, President of the Long Grove Historical Society. Mike was presented with a “welcome to the neighborhood” gift of a historical print of his choice from our archives. Ryan Messner, President of the Historic Downtown Business Association presents a ginormous check to Diane Trickey, Treasurer of the Long Grove Historical Society.